Love the three inari bears, so cute! Perfect box for it too. And the tiny cucumber with cuts are so precise. You have such a steady hand for the cutting! Look forward to your sushi bento coming up too! aw cute bears. am a fan of inaris btw. @Ribbonlicious : Thanks a lot for your lovely comment! The bears are so cute!! Looks like the perfect tasty lunch! Inari bears are very cute. I showed to Saba Man and now he is requesting sushi this week too! @hapabento : Hahaha ... Yipee! 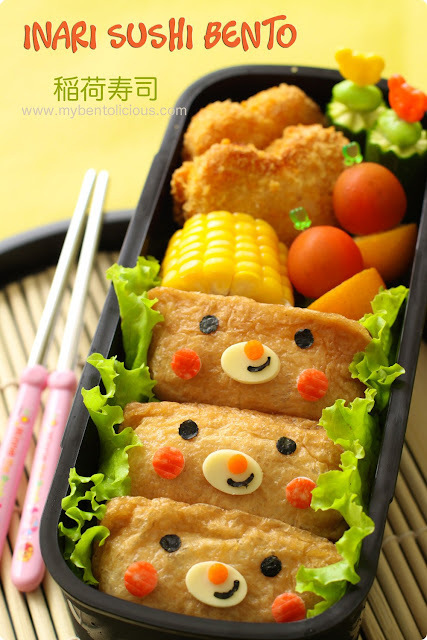 It means I can see your sushi bento this week featuring on your blog (^.^) Thanks a lot Debra!